Anna and John’s wedding at Pembroke Lodge had a lovely and informal style, and a very sweet tea-party theme with lots of vintage touches which go perfectly with the lovely setting of the venue. I can’t think of anywhere more perfect for having a yummy cup of tea and a biscuit while taking in the gorgeous views over Richmond and the surrounding area! We are recommended florists at Pembroke Lodge so luckily I get to have quite a few lovely drinks in this beautiful setting. Ann and John were married at Holy Trinity Church in Twickenham, followed by a reception in the Belvedere Suite at Pembroke Lodge. Ann and her bridesmaids and flower girl, all carried pretty handtied bouquets of ivory, cream, pale blush flowers, using mainly roses such as Avalanche, Sweet Avalanche, Vendella, Talea and my all time favourite scented pale blush O’Hara garden tea roses which open up big and multi-layered like paeonies. The church was dressed with pretty roses and gypsophila pew end posies, and two lovely pedestal displays. The church flowers were designed to be easily brought back and reused later on at Pembroke Lodge: the pew ends in hanging little vases were dotted around on the top table, and the sweetie jars table, and the two focal pedestal displays were used to frame the long top table and create a nice backdrop to the cutting of the cake. Back at Pembroke Lodge in the Belvedere Suite, each table was styled with an array of vintage frames beautifully revamped in old-gold colour, acting as a focal point for the floral displays. The frames were used as bases for pretty hand-tied bouquets displayed in old fashioned sweetie jar vases, and surrounded by china tea cups and all important all time favourite biscuits packs like Chocolate Digestives, Jammie Dodgers… What’s not to like? Following suit, the long top table was dressed with a line up of more sweetie jars bouquets, supplemented by smaller posies coming over from the church pew ends. All table centrepieces used a lovely mellow mix of ivory, cream and vintage pink roses, lisianthus, gypsophila and spray roses, with scented eucalyptus. The lovely photographs were kindly shared by Ann and John and are thanks to Guy Collier Photography. His work has been shared with me by many past brides and never fails to impress, so please visit Guy’s website if you are still searching for your dream wedding photographer. 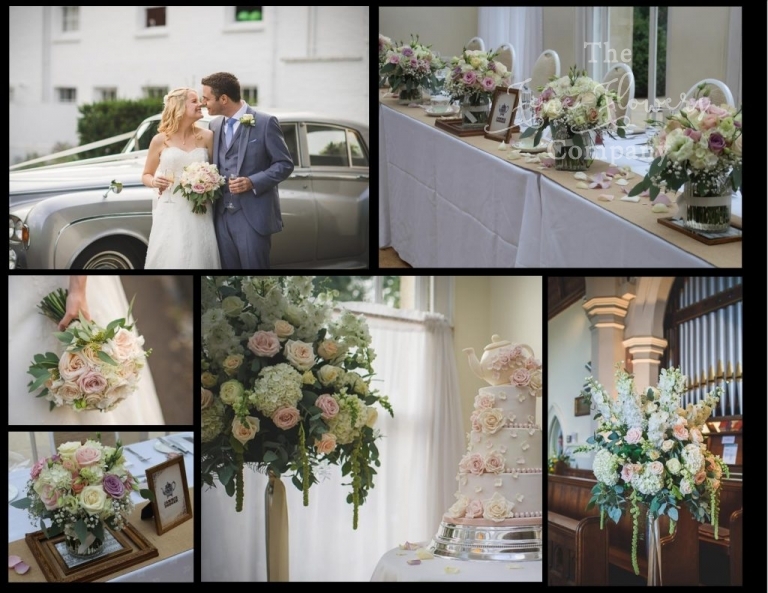 If you are planning your wedding at Pembroke Lodge and are still in need of more inspiration when it comes to wedding flowers and venue décor, then please visit our dedicated Pembroke Lodge venue featured weddings pages – you will be spoilt for choice! Or if you have lots of time to research please visit our blog pages and search for your colour scheme or own search terms. There is enough material to get lost in wedding research for days!